Microsoft is working hard to migrate all the control panel options to the new Settings app. There is no doubt that the Settings app is the future. After all, all the options from the control panel are moving to the new settings app slowly but surely. One thing that the settings app gets right is that it neatly divides all the settings and options into their own little pages. This makes it quite easy to find what you are looking for. One of the really useful things of the new Settings app is that you can pin any Settings app page to the start menu. As you can guess, pinning most used settings page to the start menu gives you quick access as you don't have to click through multiple pages to get to the option you want. For instance, I regularly open the Colors page in the Settings app to customize the Windows 10 accent color and even clear recent colors from time to time. By pinning that specific page to the start menu, I can access it with one less click. Moreover, it's just hugely convenient. 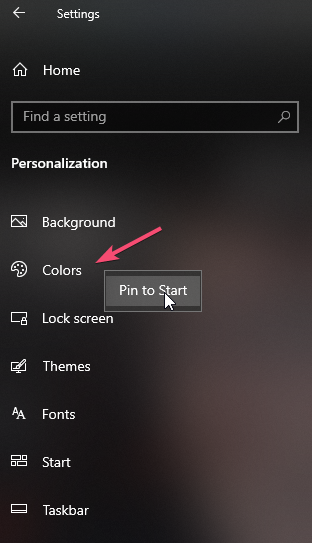 Without ado, let me show you how to pin settings app pages to start menu on Windows 10. You can pin any section or page of the settings app to start menu. Thankfully, Microsoft makes it quite easy to pin the settings app pages. 1. To start off, open the Settings app by searching for it in the start menu or by pressing the keyboard shortcut Win + I. 2. To pin an entire section from the main settings app screen, right-click on the section and select "Pin to Start". In my case, I'm pinning the System section of the settings app. 3. Windows will show a confirmation prompt. Click on the Yes button to continue. 4. To pin a specific settings app page, go to that page, right-click on the page name appearing on the left pane and select "Pin to Start". In my case, I'm pinning the Colors page. 5. Windows will show a confirmation prompt. Click on the Yes button to continue. Once pinned, this is how it looks like in the start menu. You can resize the tile by right-clicking and selecting the "Resize" option. If you have multiple settings app pages pinned to the start menu, you can group all of them in a single folder just by dragging and dropping one on top of the other. This is very useful in terms of proper organization of settings app page tile items in the start menu. If you like this article, I recommend you check out how to keep a window always on top. This tip will be very helpful in your daily activities.